Here’s a fantastic chart that shows foods that eliminate and/or prevent constipation. . Recently, I had someone tell me that they are very constipated as a result of treatment for an autoimmune disease and they’re vegan so they exclaimed “I’m plant based” and all my blood tests are perfect. They told me that they use prune juice, eat prunes and drink castor oil as well as stool softening teas to help relieve it and eventually it works but they’re constipated immediately after. I asked what their “vegan diet”’consisted of. Everything that this person eats is plantbased but processed as well as prepared in an unhealthy way. What they fail to recognize is that fake processed vegan foods are filled with binders, chemicals and sometimes preservatives. If it’s in the “food” to bind it before you eat it, what do you think it does inside your body when your body isn’t capable of processing and using those binders, while it is already having to process chemicals from pharmaceuticals for the autoimmune disease? It makes your stool bind together in your body causing major constipation. If the natural remedies for constipation are working, it means that your body will digestively function normally when your body is fed whole natural foods it can process and is able to use without byproducts. Since this person can’t eliminate the pharmaceutical treatments that may contribute to their issue, they have to keep their consumption of processed foods to a minimum in order to avoid constipation. Switching from eating animal products to eating processed fake vegan foods is a lateral nutritional diet change. It may be ethically right for the animals and reduce your blood pressure and cholesterol levels but it’s just as harmful as eating animal products. Keeping our nutrition focused on how to create wellness with properly functioning bodily functions and prevent disease or accommodate disease is how food becomes our medicine and our reward is health with minimal symptoms from whatever our body may be dealing with. .
3. Shake it up and place in fridge for a few hours until cool. 4. Serve over ice or as a morning vitality shot! Boost your wellness with this delicious and nutritious Tonic! A shot of this a day will help keep disease away! Jackfruit contains a good amount of protein. This can be added to different dishes that you prepare. You can also replace lentils in your daily diet with jackfruit seeds! Jackfruit can aid in increasing blood circulation which is vital for stimulating hair growth. You may hear a lot of talk about magnesium levels and for good reason. Magnesium is crucial for the structure of our bones. Jackfruit contains a healthy dose of vitamin B6. Vitamin B6 may help reduce heart disease. Jackfruit is so beneficial to the body in so many ways and it's so delicious. Check out our BBQ Pulled Jackfruit recipe to find out just how delicious it can be! Raw or cooked this gluten free, low carb and plant based Lasagna is satisfying, hearty and delicious! 1. Carrots provide ample amounts of vitamins C, D, E and K, as well as many minerals such as magnesium, potassium and calcium. Carrots are highly nutritious and cleansing due to their high fiber content. Carrot juice strengthens the immune system by helping to defend and detox the body from free radical damage, harmful bacteria, viruses and inflammation. 2. Cilantro contains vitamin K and small amounts of folate, potassium, manganese, and choline, as well as antioxidants beta-carotene, beta-cryptoxanthin, lutein, and zeaxanthin. Cilantro is a powerful, cleansing agent that specifically targets toxic metals. 3. Limes are a wonderful source of antioxidants & detoxifiers like vitamin-C & Flavonoids which reduce the number of free radicals accumulating in the body, as well as detoxifying the body. The health benefits of lime include weight loss, skin care, improved digestion, relief from constipation, eye care, and treatment of scurvy, piles, peptic ulcer, respiratory disorders, gout, gums, and urinary disorders. Every day we are constantly exposed to toxic metals like aluminum, arsenic, and cadmium. Toxic metals tend to accumulate in the endocrine system, muscle tissue, and even deep within the bones. Once these metals reach dangerous levels, many serious health problems occur. The most common side effects of toxic metal exposure include hormone imbalance, oxidative stress from free radicals, and in very extreme cases of toxicity, impaired organ function. 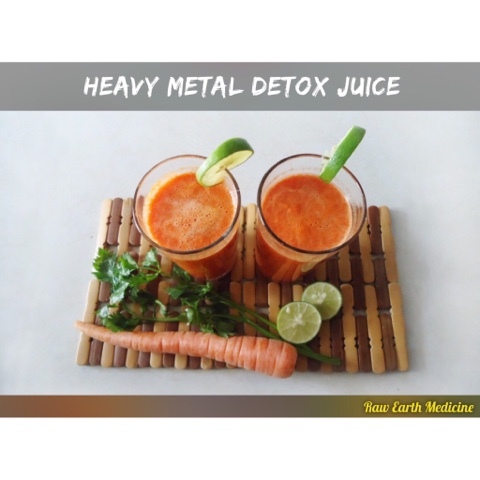 Incorporate this delicious Heavy Metal Detox Juice into your diet to help detox your body from the affects of free radicals and strengthen your immune system. Delicious and Nutritious!